Why You Should Get a National Park Passport For Your Trip to the Grand Canyon! Let me tell you why you should get a National Park Passport. National Park Passports are super cool mini book things that have spaces for stamps you can collect in all of the National Parks across America. When we went to Arizona to visit the Grand Canyon, we flew to Phoenix and then rented a car to drive to the Canyon. Most people know that the Grand Canyon is a National Park, but not many know about the other super cool National Parks surrounding it. On our way there, we stopped at Montezuma’s Castle, which is a super cool example of the ruins of where the Ancient People lived IN the rocks. You can see the little windows and houses built into the red rock, as well as read all of their signs telling you the history of the tribes that lived in the rocks. When you go to the Visitor’s center, you can get your passport stamped! If you don’t already have a passport from either a National Park that you’ve been to before or one near you, you can buy one there, or on amazon for a little bit more money. When we got to the Canyon, we explored and found a bunch of places to collect stamps! The stamps are all super cool and vary from stamps of Moose to cool architectural buildings. 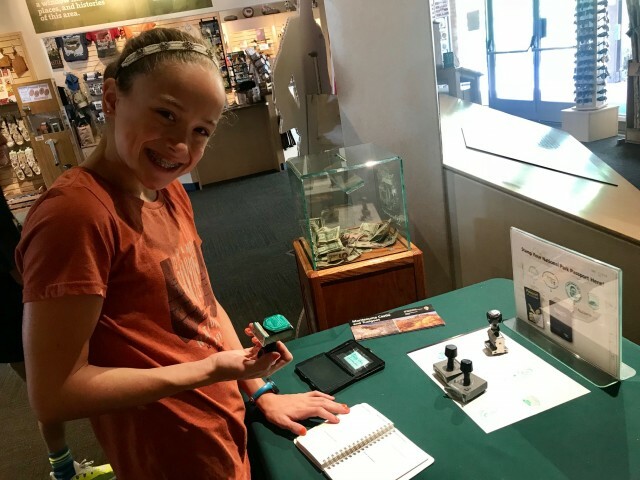 In the Grand Canyon National Park, you can get your book stamped almost every building, from the visitor’s center to the Kolb Studio to the Yavapai Geological Museum. During our stay on the rim, we went on the short ride to the Desert View Watchtower. Even if you aren’t interested in getting stamps, I highly recommend this place. It gives you a 360 degree view of the canyon, a new view of the Colorado River, and a super cool look at history. You can get your book stamped here too, and it’s a super cool stamp of the tower!